One thinks of Calangute and all those places crowded with tourists, traffic jams or packed beaches. But there is another Calangute that offers greenery, peace, tranquility and we know just the place to stay at there. 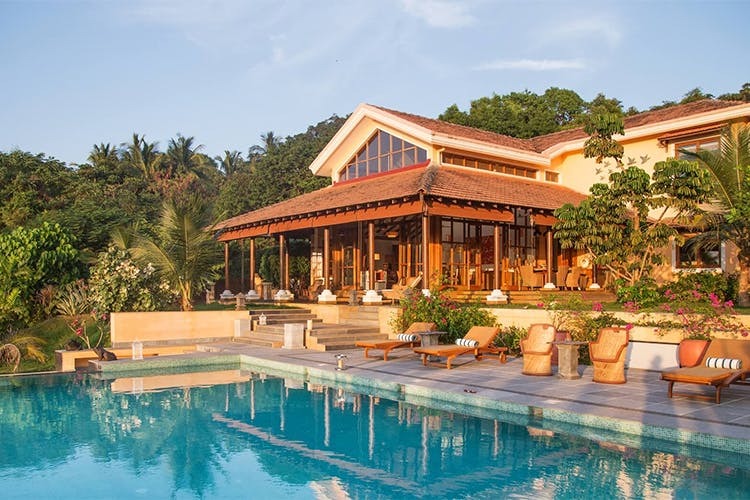 Hidden away in Calangute, on a tiny hill lies Summertime Villa. The property is an oasis of calm, with its really high wooden ceilings, and Scandinavian aesthetics reflected in every design element mixed in with a love for birds. So be it statues, tapestries, even cushion covers, you will find birds pretty much everywhere. Not to mention the large number of living ones that visit the property. Stand there in the living room that is always cool due to the constant breeze, or even sit on the verandah with a book, or the dining table outside and watch a side of Calangute that you may never have seen. The ground floor bedroom is where you will find a Koi Pond right outside it. So sit out on the verandah, watch the fish do their little antics for hours under the small waterfall that flows into the pond. It has 3 bedrooms, each one with a luxuriously large bathroom including a massive tub as well as a closet room. All are of the same size with individually designed furniture pieces from Bali. And though they have all the necessary items, due to the sheer sizes of the room, you wont be tripping over your bags or each other. There is also a large private pool outside, with a smaller plunge pool alongside that has sunken benches in it. So sit in and enjoy that glorious sunset whilst the ever-attentive staff ensures you are looked after in every way. Be it food, massages or excursions, the hosts can organize everything. So whether you want to just chill, relax and enjoy the surroundings or hop off to party the night away, this property is ideal as it is central and close by to pretty much all the main tourist spots. You need to book the villa for a minimum of 3 nights and they include breakfast, airport transfers and two acres of privacy for your holiday. Rates start from INR 36,000 during non peak times and going up to INR 55,000 during the peak December month. When you are there, do ask them about their luxurious yacht and the trips they offer with it.